In a decisive fifth game of their play-in series, Slavia Praha won on home ice against Energie Karlovy Vary by a score of 3-1. Slavia thought they had opened the scoring at the 15:45 mark of the first period, but the goal was called back because a linesman informed the referees of a high-sticking infraction committed by Slavia's Marek Tomica before the goal was scored. Despite the displeasure of the crowd and the protests from Slavia coach Vladimír Růžička, the call was correct and the game remained scoreless after a period. In the second period, Tomáš Žižka struck twice, both assisted by Jakub Sklenář, to put Slavia firmly in the driver's seat. Late in the third, Slavia's Lukáš Krenželok and Karlovy Varys Václav Skuhravý traded goals to make it a 3-1 final and send the crowd of 7,394 home happy and satisfied that they can return for another round. All five games in the series were won by the home team. 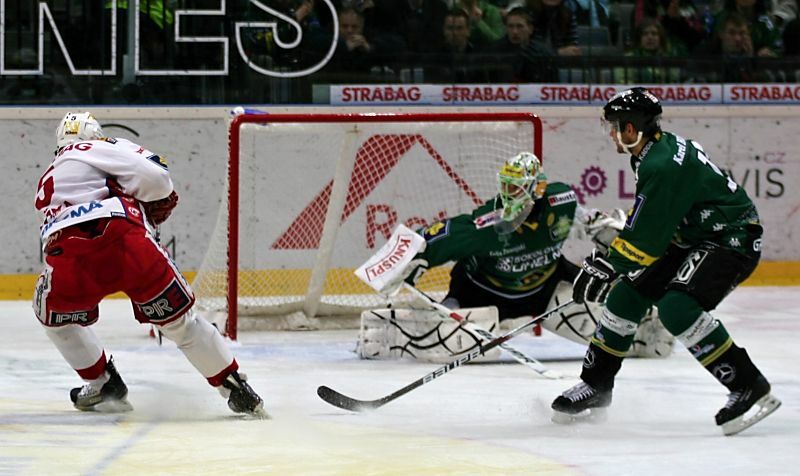 Slavia won the first two at home, the first one in a shootout, before Karlovy Vary bounced back with a home-ice overtime victory in game three on Saturday night. They then followed that up with a 7-0 triumph, which included 5 first-period goals, to force the fifth and deciding contest on Tuesday night. The Slavia victory sets up a quarterfinal date with Bílí Tigři Liberec in a series that begins in Liberec on Saturday night. Also starting that night will be Benzina Litvínov, who earned a spot in the quarters with a play-in victory over Plzeň, visiting top-seeded Oceláři Třinec. The other two quarterfinal series, the match-ups already determined before the play-in round, begin on Thursday. Those series feature Vítkovice Steel against Mountfield České Budějovice and PSG Zlín against Eaton Pardubice. Click here to see the entire playoff schedule, including statistics of games already played. Television channel ČT4 Sport is scheduled to televise one game every night that there is one, although some of the games won't be shown live. Here is the schedule for the first four games. Note that all televised games will also be available online at www.ct24.cz/sport and most other games will be available live at tv.hokej.cz. All times listed are Central European (UTC +1).